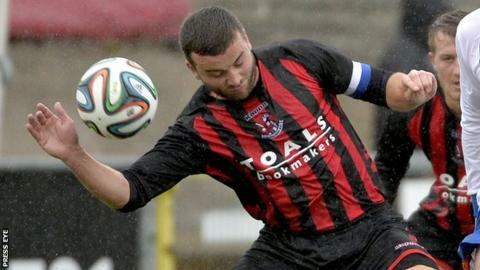 Crusaders welcome back skipper Colin Coates after suspension for Saturday's Irish Premiership game with Glenavon. The Crues trail leaders Linfield by two points, while Glenavon lie in fifth. Meanwhile Glentoran's Director of Football Roy Coyle will take charge for his side's trip to Warrenpoint Town following Eddie Patterson's dismissal. Basement club Warrenpoint are without rib injury victim Darren King and the suspended Jordan Dane, while Mark Clarke is doubtful with a foot injury. 'Point manager Barry Gray is also missing long-term casualties Johnny Parr and John McGuigan. Michael McNamee presents coverage of all six Irish Premiership matches on Saturday Sportsound. Joel Taggart and Tommy Breslin will be at Seaview to watch Crusaders play Glenavon while Grant Cameron and Liam Beckett take in Coleraine against Cliftonville at Ballycastle Road. The programme will also have reports from the remainder of the afternoon's games and news of the rest of the day's sporting action. Linfield will hope to have Andy Waterworth, who has scored 12 goals in 11 Premiership outings, back in their squad after injury for the visit of Carrick Rangers to Windsor Park. Coleraine's early-season form has been boosted by the goalscoring exploits of striker James McLaughlin, who has bagged five goals in five games and 10 for the season. "We have a really good changing room at the moment. We have a very tight group of players and there is a real togetherness among the squad," said Bannsiders boss Oran Kearney ahead of his side's game against Cliftonville at Ballycastle Road. Cliftonville boss Gerard Lyttle has bolstered his squad by signing former Celtic winger Paul George and he knows his team face a tough task against an outfit "who have got a bit of momentum going". "We have achieved some good results but we have to continue to work hard and try to improve. I can't speak highly enough of the application of the players," said Lyttle. Meanwhile Ballymena United manager Glenn Ferguson has urged his players to be more clinical in front of goal as they prepare to play struggling Dungannon Swifts at the Showgrounds. The Swifts are without banned midfielder Jamie Glackin as they aim to halt a run of four consecutive league defeats, while the hosts have themselves gone three matches without picking up a point. "There are four teams being cut adrift at the bottom of the table and whoever can put together a run of two or three wins in a row out of five or six games has a chance to pull themselves clear," argued Swifts manager Darren Murphy. Portadown entertain a Ballinamallard United side who are without influential midfielder Cathal Beacom, ruled out of the visit to Shamrock Park with a hamstring problem. Beacom could be absent for three weeks, but on the plus side, Stephen Feeney has recovered from a calf complaint in time to take his place in the squad.